On a cool and damp September 12th morning 17 year old Ann Titone awoke as she did every other week day. With the exuberance of endless possibility and naive teenage confidence filling her heart, she went through her morning ritual of busily getting ready for school. It was 1993 and she along with 44 of her friends had just begun their senior year at Grandview High School in the small town of Ware, Missouri. She felt like she was on top of the world. Ann was one of the popular girls in school, not one of the snobby ones, but one of those girls that everyone loves, and loves everyone back. Later that year she would be voted homecoming queen. She was the class clown. Her grades were great, her teachers loved her, and the only drama in her life was the kind that young women filled with estrogen and growing independence have. It was going to be the best year of her life, she was just sure of it. Ann doesn’t remember much of anything about that day, or the two and a half weeks that followed it. She was told that she got in her car and started driving to school. It was about 7:00am and she was alone driving the same route she took every day in the 86 Dodge Diplomat that her parents had bought her. She knows she was in a wreck, she knows there was another vehicle, and she knows the other driver was killed. Ann woke from her coma two and a half weeks after that day so badly mangled that she couldn’t move. She was in a hospital bed, in traction, a busy network of tubes running into and out of her battered young body doing the tedious yet critical job of keeping her alive. Above her bed, a glowing monitor gave the reassuring news that this beautiful young woman that everyone loved was still courageously fighting for her life. The story of what happened was pieced together for her by others. It had rained the night before and it was cool so tire traction could have been a factor. The other driver was a 26 year old male that had a reputation for being a partier and was seen the night before drinking alcohol at a party. He was also not wearing his seatbelt and was pronounced dead on the scene. Ann had been traveling down a long stretch of highway and coming into a long lazy left hand curve. She assumed she may have been going a little fast as she usually did, but doesn’t have any recollection of the day. The other vehicle was already into the curve coming toward her. Somehow they collided head on. When Ann didn’t show up in school her friends called her uncle and then he called her parents. Her very concerned father started driving the route he knew she took to school each day and came upon the scene of the crash. He immediately recognized her car then in the same horrific moment, he saw a body on the ground covered with a sheet. The bottom of his world fell out. He coasted to a stop and going through a hurricane of emotions from absolute terror, to relief, to absolute terror again, he discovered that his little girl was not under the blanket but was being frantically cut from the steaming hulk of crushed and twisted metal with the jaws of life. She had been wearing her seat belt and survived the impact but had suffered a compound fracture of her left femur. The broken femur was driven up through her quadricep muscle and out through her hip so that her kneecap was sitting about half way up her thigh while the jagged femur bone was jutting out of her hip. She had a dislocated left hip and a fractured right hip. The right side of her jaw was broken and the left side was dislocated. She had 3 broken ribs and a punctured lung on the right side. Her spleen had been lacerated. Her face had several lacerations and contusions. After being cut from the wreck she was transported by emergency paramedic helicopter to the St.Louis University Hospital intensive care unit. Her life was hanging by a very thin thread when she got there. Ann recalls being told that once he left the scene her dad went to his parents house and like any father would, he completely broke down. In what would be viewed by those with **experience investigating motor vehicle accidents as potentially questionable policies and procedures, the local police conducted their investigation and were unable to recreate the incident from the evidence at the scene and therefore determine the exact cause of the crash. Armed with very few facts they made an easy assumption. They told Ann that because she was the younger and less experienced driver it was probably her fault. No charges were laid, obviously due to a lack of any evidence to support them but their determination would have been enough for the insurance company and the police to conclude the matter. With what seems to be little thought on the impact their unsubstantiated words would have on the young woman, the case was closed. 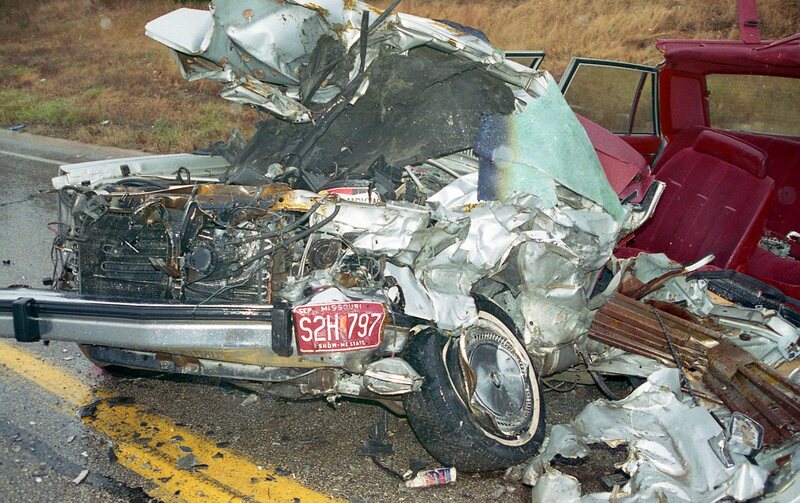 Motor vehicle accidents are recreated all the time but it requires a trained expert to do it. This motor vehicle accident would be one of the simpler ones to recreate because there were only two vehicles involved, very little traffic, weather was not a problem in gathering evidence, and the scene was essentially undisturbed when the police arrived. At first glance, logic and physics alone indicate that even if her speed and a slippery road were factors, the inertia from her car taking a left hand turn would force her vehicle to the right and away from the oncoming traffic lane. She would have been pushed toward the roadside or ditch. The inertia of the oncoming vehicle on the other hand would have a tendency to force that vehicle to the left and into her lane. There was also the issue about his consuming alcohol the night before and presumably having little sleep being so early in the morning when the crash occurred. Both are factors that have been proven to have a significant affect on driving skills. If we were going to settle for making assumptions rather than investigating the crash properly; then one would think that either of these obvious facts would carry a greater burden of responsibility than the assumption that Ann’s age would cause her to lose control of her vehicle. Not in this case. There are many factors that bring their investigative conclusions into question and now with the evidence gone forever, we will never know what really happened. What we do know is that they admittedly didn’t know for certain what happened so they had no right to assume anyone was at fault or probably at fault. It appears like the police department and insurance company both needed to determine fault just so they could close the matter. Rather than do the work and spend the money to find the correct answer for certain, they settled for putting the moral responsibility on Ann because she was the easy target. A young female driver, a stereotype. Ann Titone has rarely shared her story and until she did this interview, she had never considered that perhaps the police were maybe wrong, or even irresponsible in how they arrived at and delivered the results of their investigation to her. She just trusted that they did their best and quietly accepted the verdict as she has no memory of her own to dispute what they said. Whatever she went through to rehabilitate her body and get back to living her life again was a feather compared to the weight of the scars and guilt that she has carried internally ever since the crash. Ann still can’t cry about it and while she has grown accustomed to the emotional scars, they have never healed. What followed the car wreck was two and a half months of intense rehab and physical therapy in the hospital before she was finally released and able to go back to school. When she did, the welcome was beyond anything she could imagine. Life had almost returned to what normal was going to be but there was still some unfinished business that had consumed Ann’s soul. She needed to know more about the young man that was killed in the crash and she had some things she needed to say to him. Ann felt many things toward the young man that was killed in the wreck that morning, some anger for not wearing a seatbelt, some deep sorrow, and regret at his life having ended when he was so young. She wrote him a long letter and in it she shared all of her feelings. In March 1994, 6 months after his death, she visited his grave and read the letter to him. Time continued to pass and life went on for Ann but the reminders were always there. Competitive figure came along and while Ann excelled in the gym and on stage the physical scars on her hip and leg were very visible and made her feel self conscious. In November of 2009 right after competing in the Kentucky Pro Figure Championships she had surgery to repair the scar on her hip and now it’s barely visible. Ann Titone is a survivor in many senses of the word and to survive intact you have to find some good in amongst the overwhelming bad. Ann hopes that her story will touch and inspire others in some way to endure whatever lays formidably in front of them. She admits she never talks much about the past or feelings surrounding the whole incident either good or bad. When she did for this interview her voice was devoid of any emotion, almost monotone as she recounted the events like she was reading a news story from the paper. Keeping the past buried has been her way of putting it behind her but as her words reveal, not that far behind. **The writer of this article is a former police officer with experience investigating motor vehicle accidents. According to nermerology, everyone has a life path. Mine is 1. A person with Life Path number1 is hard working, a natural born leader, has a pioneering spirit that is full of energy, and a passion for art. They have a strong desire to be number one, which means a person with this number can manifest very easily. Due to their determination and self motivation, they wont let anything stand in their way of accomplishing a goal. Their drive allows them to overcome any obstacle or challenge they may encounter, and they have a desire to accomplish great things in their lifetime. Their only need is to focus on what they want in order to achieve it. Everyone has a story... this is mine.